When designing with nature’s guidance and inspiration, creative energy flows as we mimic natural systems through the design process. The principles of Permaculture can be broken down into a numbered sequence but essentially they should all have the number one in front of them. There is no separation for natural systems work in holistic means and we must understand that the principles themselves are so intertwined that for this principle of multi-functions to come through in a design relative location must be applied as well. Thus by building on relative location, we can locate items so that they fill a myriad of functions. 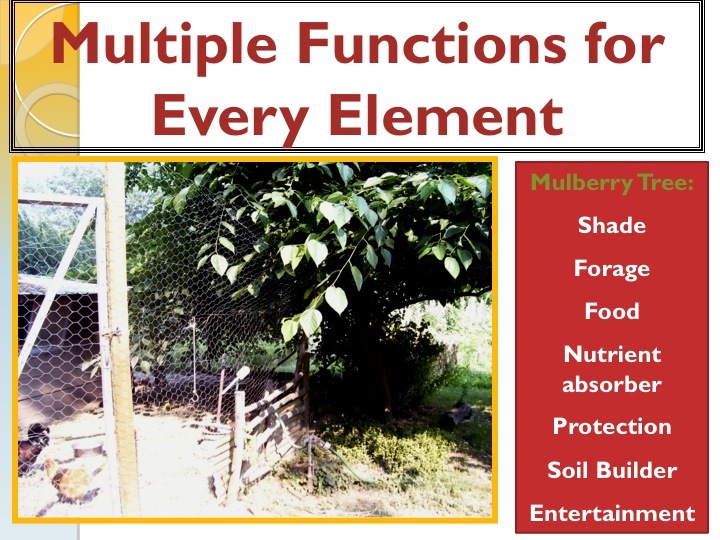 The mulberry tree is placed on the southern side (sector planning) of the coop to provide shade for the chickens in this dry and hot climate of Northern California. Through our functional analysis we find out, that mulberries drop their fruit when ripe. Consequently, the plant performs another function of providing forage for the chickens that are grazing below. When I go to feed the chickens or pick up some eggs, I can pick the ripening mulberries from the tree or those located outside of the strawyard. Furthermore – because the chickens are constantly depositing waste in the strawyard – the tree is able to utilize and absorb this concentration of nutrients. Conversely it is also able to create soil itself by its leaf drop and its association with micro-organisms in the soil. Also by placing this element in relative location of the strawyard, the chickens are afforded some aerial protection. Since the site was located on the banks of a major western U.S. River, there is avian predation from hawks and eagles. I mean it taste like chicken afterwards and so we must give them the correct habitat so that they will not be randomly picked off. Lastly the chicken and mulberry tree from a wonderfully entertaining relationship. When you go into the yard and shake the mulberry tree when the fruit are ripening, a hundred or so mulberries will drop setting off a feeding frenzy comparable to the piranhas and wounded flesh. Again this is only possible through the principle of relative location as the mulberry tree must be next to the cage for that functional interconnection to occur. This is great, see how we can ‘transplant’ life-enhancing rules for agriculture/livingsystems to technological systems.